I have been writing the series of posts on early motherhood or a baby's first year for Huggies and BlogHer. I like writing on the topics they give us because sometimes it's things I never wrote about. Today is all about taking the home pregnancy test to that first doctor visit. With Harper, I had taken a zillion tests along our journey through infertility. The month I found out I was pregnant with her - I didn't have any idea I was actually pregnant because we were taking a "break". I took one anyway on Cinco de Mayo 2008 before work and when I went to get it and throw it away (never looked at it until this point) - I realized it had TWO lines instead of one!!! I have never been so shocked in all my life. And to confirm - I took a few more tests throughout the day. I called my doctor's office when I got to work and I told the nurse first and then the doctor got on and SCREAMED! She had been through the journey with me and I loved her reaction. I went in that day to get a blood test and confirm. We were leaving 3 days later to go to Hawaii on a "we can't get pregnant so we might as well go to paradise trip" so I wanted to make sure everything was okay. And it was! We had our first ultrasound when we got back from Kauai around 6 weeks. With Hollis it was totally different because we weren't trying. I had told Scott about a week before we found out that we were pregnant that I really wanted to wait until Harper's second birthday and then we could start thinking about trying. In my head and heart - I honestly didn't think we would get pregnant again. Harper was 18 months old and I realized I was a few days late. I also realized I had been having MAD cravings for french onion soup and dip which I thought was strange. I decided to take a test one morning - I don't remember the exact date this time but I do know it was during vacation Bible School. I was SUPER shocked when I found out I was pregnant. My first thought was "we aren't ready!" But God's timing is perfect! What an amazing blessing and surprise Hollis was to us! This time I called my doctor but I don't think I went in until around the 10 or 11 week mark. We had an ultrasound and everything was good! 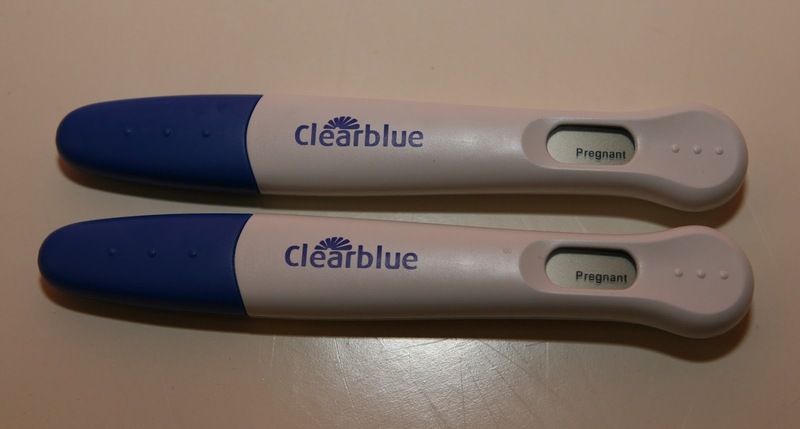 Getting a positive on a pregnancy test TWICE was the greatest thing in my life! I'll never forget the feelings of excitement and happiness and knowing our lives were about to change!